I wanted to hurry up and post this before father’s day because I don’t want to ruin the day with this news. 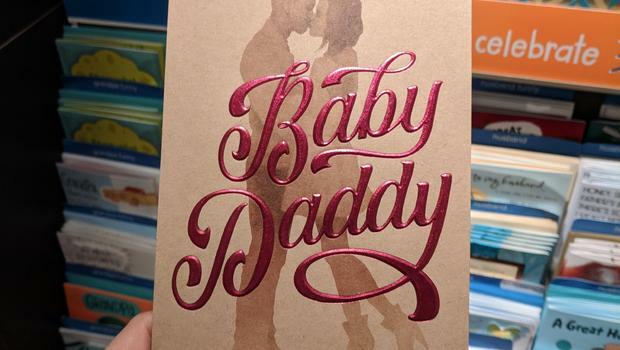 Unless you have been living under a rock then you may have heard about the baby daddy greeting card Target drama. Yes, I call it drama because the situation is totally unnecessary. I don’t understand some of the people of my race. How come it’s okay for some of us to come up with words or be able to say certain words to one another but the minute a white person says it they are being racist? Yeah, I said it. For instance the “n” word is a very offensive word but some black people call one another that. Now stay with me I’m about to make a huge point. I recently took a class and the subject came up about what is acceptable language socially. Long story short it was agreed upon that if it’s not acceptable socially then it should not be expressed verbally publicly. Still what is offensive? I have never liked the phrase “baby daddy”. I would cringe when I would hear some females say “oh he’s just my baby daddy”. There is nothing cool about having a baby daddy or for some mothers baby daddies. This phrase was suppose to be the new in words like “fleek” a word that I wish would go far away!!! There were classes that were being taught in school about Ebonics. It was taught so that other races of people could understand the blending of words ebony aka black and phonics sounds. The Britannica describes it as “a form of American English used in the home or for day-to-day communication rather than for formal occasions”. The Merriam-Webster refers to “baby daddy” as slang. The Urban Dictionary defines “baby daddy” as a father of a woman’s child that she is not involved with” The sentence used to explained the meaning of the words went something like this “Who is that? “Girl two”. That’s my dumb baby daddy”. So if this word is in the urban dictionary and it’s being used in heavy rotation, what’s the big deal about the “baby daddy” greeting card? I could be wrong but I think that when something sheds light on things that are being celebrated within the black community that should not be. The reality of dysfunction becomes real then all of a sudden it comes off as being “racist” because the dysfunction of what is going on in the black community is being exposed even if it was done unintentionally. Getting all up in a uproar behind a greeting card just shows that the truth hurts.